For TECHNOPATH CLINICAL DIAGNOSTICS including Quality Control Material, IAMQC QC Software and IVD Raw Materials and Proficiency Sera manufactured by Technopath Clinical Diagnostics. Technopath Clinical Diagnostics today announced the launch of it's new Multichem® AMH quality control product. Multichem AMH is intended for use as a third party, liquid frozen quality control material to monitor the precision of laboratory testing procedures for Anti Mullerian Hormone Assays. Anti-Müllerian hormone (AMH) assays are used in the evaluation of ovarian reserve to predict response to controlled ovarian stimulation in women with infertility issues. Research studies have also demonstrated that AMH may be used to estimate the time to menopause for an individual woman, as AMH has been found to be a good indicator of reproductive aging. Additionally, studies have shown that the use of AMH may be useful in the diagnosis and monitoring of polycystic ovary syndrome. The new quality control product launched by Technopath Clinical Diagnostics will facilitate laboratories that are running AMH assays to satisfy their regulatory demands by incorporating independent quality control materials in to their quality policies. Technopath Clinical Diagnostics, a privately held Irish Life Sciences Company founded in 2004, is a global leader in the development and manufacture of quality control solutions which enhance the quality of patient testing by clinical laboratories. In 2008, Technopath Clinical Diagnostics launched the In-Vitro Diagnostic industry's first truly consolidated Immunochemistry Quality Control (QC) materials. The principal focus and vision was to remove the need for multiple test materials through consolidation of a large number of analytes in to a single product. Consolidation enables clinical laboratories to significantly reduce handling requirements, reclaim storage and minimise waste, leading to a more efficient quality control process. Technopath Clinical Diagnostics is now a high growth company based upon the success we have enjoyed in our home markets and the recent closure of signiﬁcant product development & supply agreements on a global basis. Technopath Clinical Diagnostics has been ISO 13485 accredited since 2009 and has been successful in achieving US FDA 510K and China FDA approvals for all of our Multichem® QC products. 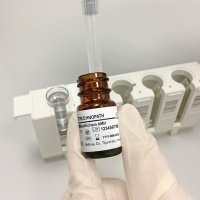 For more information on Technopath Clinical Diagnostics, visit www.technopathcd.com. We are a leading global developer and manufacturer of quality control material and software for clinical laboratories. Techno-path Manufacturing Limited. Registered in Ireland No. 419288. Registered Office: Technopath Life Sciences Park, Fort Henry, Ballina, Co. Tipperary, Ireland. Technopath Clinical Diagnostics is a registered business name of Techno-path Manufacturing Limited.